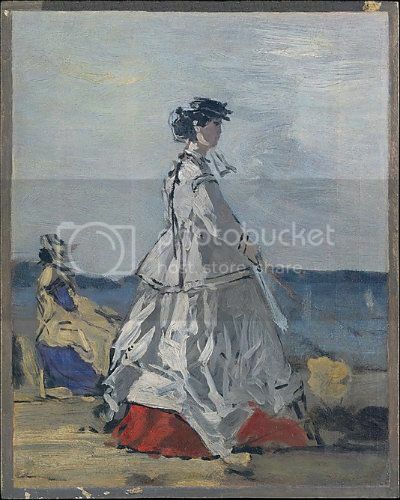 Eugene Boudin, Princess Pauline Metternich on the Beach, c. 1865-67. The Metropolitan Museum of Art, New York. Pauline Metternich (1836-1921) was born to in Vienna to Count Mortiz Sandor, a Hungarian nobleman, and Leontine von Metternich. Count Sandor was a famous horseman and, according to his daughter, “daring to the point of recklessness, and altogether what is best described as a ‘character’”. 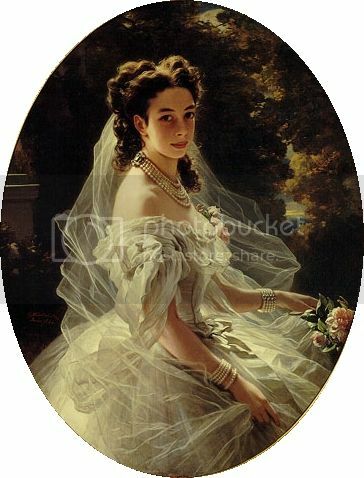 She married Prince Richard von Metternich, a diplomat, in 1856. In 1859, Prince Metternich was “sent to France… in order to ratify some clause of the Treaty of Zurich, which had been concluded when the war with Italy came to an end”, where his wife joined him. Prince Metternich was soon appointed Ambassador to France, and the couple remained a fixture at the court of Napoleon III until 1870, when the Second Empire came crashing down. Metternich was known for her intelligence and wit, and maintained a close friendship with the Empress Eugenie. The pages of another volume of her memoirs, My Years in Paris (1922), are full of loving descriptions of the Empress, painting her as a kind and devoted friend. When the Second Empire fell, it was Metternich whom the Empress trusted to smuggle her jewels out of the country. The gown immediately caught the eye of the Empress, and Worth’s career as the great couturier of the nineteenth century began. Metternich, My Years in Paris, 7. Metternich, The Days That Are No More, 8. Metternich, The Days That Are No More, 9-11. Metternich, My Years in Paris, 199. Metternich, The Days That Are No More, 34. Metternich, My Years in Paris, 23, 220. Metternich, The Days That Are No More, 11. Metternich, My Years in Paris, 60. Metternich, My Years in Paris, 56-58. Metternich, My Years in Paris, 58.